Many people are loyal fans of the Sony brand, not just for their smartphones, but for their televisions, displays and image processors and sensors for cameras of all types. The Sony Xperia XZ Premium is the technological essence of almost all these areas. So is the Xperia XZ Premium now the ultra smartphone for 4K content, HiRes audio and SuperSloMo videos? Our review tells you everything about the XZ Premium from Sony. The Japanese company Sony is following a predominant trend in the smartphone market: top smartphones are becoming more expensive step by step. The Xperia XZ Premium was released in the American market in June 2017 at a price of $649.99. If the price doesn’t deter you, you can choose between a deep-sea black polish with a high glass, a mirror-like chrome finish or a feminine bronze-pink version. If the Sony Xperia XZ Premium is too big, dazzling and expensive for you, but you really want to have the super slow motion features of the new Exmor-RS image sensor, then the Xperia XZs is for you. That smartphone offers the same camera technology, but is smaller, more restricting and is somewhat ‘cheaper’ at $599.99. There are only a few design icons in the automotive industry that still stick to their original design, like what we see in the production of refrigerators or soda bottles for example. Think of the Porsche 911, the VW Golf, and the original Coca Cola bottle or retro Smeg refrigerators. It is questionable whether Sony’s OmniBalance design will go down in history as equally iconic as these classics, but we should certainly respect Sony for persevering with this design. Instead of short-term design trends, or even design experiments such as bezel-less display integration or ultra-flat and ultra-light construction, the Japanese designers are sticking to their timeless OmniBalance design. Once we see their sales figures, we’ll learn whether Sony Mobile has struck a chord with consumers. As unspectacular as the silhouette of the Xperia XZ Premium may be, the color scheme of our test device is still all the more striking: a high-shine chrome. The deep-sea black and bronze-pink colors are a little more subtle, but also have a similar glossy look. You’ll need to carefully and thoroughly polish the Xperia XZ Premium to keep its appearance flawless, since fingerprints and other markings quickly appear on the device. The XZ Premium is surprisingly comfortable to hold. The plastic flanks are rounded and nestle into the palm of your hand. The only problem is that this feeling doesn’t last long. The weight of almost 200 grams, together with the slippery glass back and the enormous dimensions require your small finger to support the phone. Since the upper and lower sides of the Xperia XZ Premium have edges, this supporting finger will start to hurt after just a few minutes. The upper and lower sides of the Sony Xperia XZ Premium do offer a kind of quasi-feature: the device can stand on a flat surface without any support. If you choose the chrome version, then the phone can also act like a cosmetic mirror. Sony is also very particular about the placement of the fingerprint sensor. Instead of mounting it on the rear or front of the device, it’s been located in the right flank of the casing for several generations and is integrated into the on/off switch. There’s just one exception: all US models don’t have the fingerprint sensor. Why? Sony Mobile USA is quite reluctant to provide more detailed information about this decision and has stated that it’s just a market-specific decision. Thanks to Gorilla Glass 5 on both the front and back, the Xperia XZ Premium is well protected against scratches. The use of Gorilla Glass on the back, however, has no real function or benefit like the Galaxy S8 or the US version of the G6 does, because in those cases the material was used to give the smartphone the wireless charging function. Unfortunately, the ratio of the display to the frame area is a little less than 68 percent, which isn’t impressive in comparison to almost all top-range smartphones from 2017 or even 2016. The advantage is that Sony is the only manufacturer to integrate a display with 4K resolution and HDR support. In the following section I’ll discuss whether this is an advantage or disadvantage. When it comes to displaying content, Sony can draw on the know-how of its television division. And there is a clear trend in Bravia TVs: in the future, Sony will switch its own flat screens to 4K panels and the higher-quality Bravia TVs will also receive HDR support. The trend will also be implemented in smartphones and Sony will benefit from the know-how from its TV division. But hasn't there already been a Sony smartphone with a 4K display? And wasn’t the full resolution of the display limited to a few Sony apps? The answer is yes, Sony already had a 4K display on the Xperia Z5 Premium. Unfortunately, the 4K resolution was greatly restricted because the full resolution could only be used in the in-house gallery and video app. Sony expands the use of 4K resolution to some other areas of the Xperia XZ Premium, as third-party apps can now also benefit from the higher resolution. These include YouTube with 2,160p videos and Amazon Prime Video with UltraHD and HDR support. To fully use the full resolution of the XZ Premium, Sony is naturally dependent on the app developers and content creators. Currently, it's still manageable for them to offer 4K content with HDR support, which is not easy to find and isn’t exactly suited for everyone’s taste. Time will tell whether Sony has made the right investment with the 4K display and HDR support, and also whether the other Sony divisions such as Sony Pictures and Sony Playstation will have to soon provide appropriate content for the high-resolution display of the Xperia XZ Premium. In everyday life you don't benefit too much from the extremely high pixel density of 807 ppi. Images look very sharp, but the brightness of the display is not very high. In the maximum brightness setting of the display you’ll be able to see something in direct sunlight, but in a subjective comparison the displays of the HTC U11, Samsung Galaxy S8, LG G6 and Huawei P10 Plus, all the other displays are much brighter and therefore more readable. Depending on how you hold the XZ Premium to the sun, the chrome matte may cause a glare on the top and bottom parts of the display. The Achilles heel of Sony products in general was and still is the software. At first glance, the weaknesses and sometimes illogical arrangement won’t catch your attention. It’s only when you use Sony products for a longer period of time that it’ll start causing wrinkles on your forehead. But let's start with the software that the Xperia XZ Premium comes with by default. The Xperia XZ Premium comes with Android 7.1.1 Nougat and the Xperia UI when it’s first used out of the box. Some third-party software was pre-installed on our test device after installation. There’s also of course Sony's own apps for photos, videos, Playstation Network and Lifelog. Some of these Sony apps can be uninstalled, but most of them can only be deactivated. On our test device some third-party apps such as AVG Protection and Amazon App couldn’t be removed and could only be deactivated. The Xperia XZ Premium's software is by and large the same as that of Sony. Unfortunately, it also means that the logistical problems mentioned at the outset are also present. Why is it possible to switch the on/off button to a camera quick start button in the settings if it has a dedicated and non-configurable camera button? Why is it essential to separate the audio settings for headphones and speakers in the settings? And why can't you add an equalizer to the audio settings? In addition, Sony's camera software is littered with unusual arrangements: the 4K video function is hidden in additional camera apps, while manual mode separates ISO settings from those for white balance, shutter speed and exposure correction. The Sony Xperia XZ Premium is powered by a Qualcomm Snapdragon 835 with 4 GB RAM and 64 GB ROM. Qualcomm's high-end SoC will also be used in the US version of the Samsung Galaxy S8, the HTC U11, the Xiaomi Mi 6 and the OnePlus 5. The synthetic performance of the Xperia XZ Premium is correspondingly high, as you can see from the following comparison table. We consider it rather uninteresting as to which version and which chip was exactly used, because a single component isn’t decisive for the performance, and the tuning of the entire system is more important. In fact, the difference between UFS 2.0 and UFS 2.1 will certainly not be noticed as long as the overall package including the software is well balanced. In the case of our test device, which is equipped with UFS 2.1 according to the values from Androbench, there is also no significant drop in performance in the XZ Premium. The LTE modem is one component of the Snapdragon 835 SoCs that is often neglected. The X16 modem can achieve download speeds of up to one GBit/s thanks to carrier aggregation, 256QAM and 4xMIMO. But for this to function, the network operator must first of all support these technologies, the chosen rate must be designated for this maximum connection and there must also be conditions optimal for it. Those are a lot of ifs, but at least the XZ Premium is prepared for the future. The XZ Premium proves to be a fast and unproblematic smartphone in everyday life. Sony has also resolved the issues with overheating, for which it had been denounced in the past, particularly when recording 4K videos. This is ensured through a new three-layer heatspreader and a redistribution of the heat-generating components. The main problem with the Z5 Premium was the placement of the main processor near the camera sensor. It used a heatpipe to conduct waste heat away from the hot spot, but this was unfortunately not as effective as they had hoped at Sony. 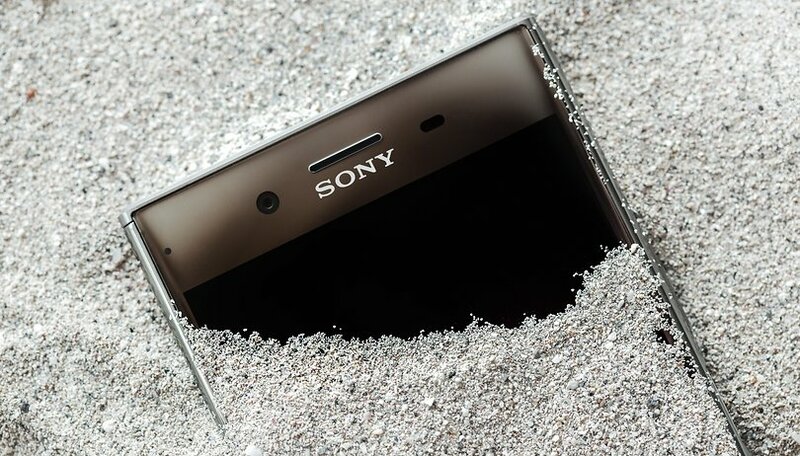 With the XZ Premium, Sony has learned from past mistakes and placed the Snapdragon 835 far away from the new motion-eye camera sensor. In addition, the three-layer heat dissipation plate ensures a better distribution of the waste heat. If heat starts to build up in the XZ Premium, the smartphone can be cooled in cold tap water thanks to IP68 certification, even if the connections for USB type C and headphones are open. The XZ Premium’s excellent workmanship and high-quality materials are captivating for all the senses. It offers the eyes an exhilarating experience thanks to its 4K display with HDR support. But what about background noise? The stereo front speakers are pleasantly loud and clear for smartphones, but the Xperia XZ Premium only comes into its own with the right audio accessories. As was the case with its predecessor, the top 2017 smartphone from Sony also supports HiRes Audio, LDAC and DSEE. But for this you’ll need the necessary accessories with the respective features and of course audio data without compression and in the highest quality. Currently, the search for and detection of corresponding music data with 24Bit and 96kHz is difficult for the layman and also the offer is not yet adapted for the masses. But if you consider that Google has planned to implement Sony's wireless LDAC audio technology for Android O, you should be able to enjoy high-quality audio in the future. As with the 4K display, the added value of the content on offer is there, but an additional Sony division could be of assistance here as well: Sony Music. We are curious to see if the artists under contract with Sony Music will record and offer their songs in HiRes Audio in the future. The Bluetooth standard defines the framework; the implementation of individual functions is optional and is always carried out in consideration of the customer's benefit. If the customer's demand for such details is high enough, various features could also be added by means of a SW update. The Sony Xperia XZ Premium camera is the star of the entire smartphone - or at least it should be. For the first time, Sony is using a brand-new image sensor in its own smartphones, which is not yet used by any other smartphone manufacturer. You can see their initiative to make the products from their our own divisions first available in Sony products. The highlight of the entire camera unit is the new three-layer sensor from Sony Imaging, which was introduced on February 7, 2017. The newly added third layer of memory chips in the image sensor makes it possible to shoot extreme slow-motion images at speeds of up to 960 frames per second. The memory units buffer the collected image information until it is read out, which act as a kind of cache system in the image sensor. With optimum lighting conditions, the Sony Xperia XZ Premium takes beautiful photos like all current flagships. The high resolution of more than 19 megapixels brings many fine details to the images, but in practice this does not necessarily improve the detail of the reproduction. In the following photo we have highlighted a few areas where you can see some subtle differences between the Google Pixel and the Xperia XZ Premium. In the lower part of the TV Tower's sphere, for example, the Pixel performs better, while at the side of the Park Inn, the Sony smartphone brings a hint of more detail to the picture. With the HDR auto mode activated, the dynamic range of the reproductions is excellent. Compared to the Google Pixel, however, Sony brightens up the dark areas of the image with high-contrast subjects to a lesser extent. Particularly in photos with large, rather dark areas of color, the Pixel's images look more vivid in direct comparison. In low light conditions, however, the Xperia XZ Premium doesn’t perform particularly well, and perhaps the high resolution of the sensor has something to do with it. In direct comparison with the Galaxy S8, for example, the detail reproduction is noticeably worse. On the one hand, the higher resolution of the sensor may be somewhat to blame, but on the other hand, a look at the EXIF data reveals some further details. The Galaxy S8 took the photo with ISO 1250, the Xperia XZ Premium with ISO 3200, and Samsung was able to achieve this with the larger aperture of f/1.7 compared to the f/2.0 in the Xperia XZ Premium. The Galaxy S8 also had a longer shutter speed of 1/10 compared to 1/15 seconds, which is still possible with the Samsung OIS. Otherwise, the Xperia XZ Premium delivers a decent performance in terms of automatic exposure, color rendering and white balance. The camera app makes a pretty nifty impression, but can't quite keep up with the speed of the Galaxy S8. All of the test photos can be viewed here in Google Photos. But what about video quality? 4K videos can be recorded at 30 fps with the Sony Xperia XZ Premium. Unfortunately, the software only records in video mode with a maximum 60 fps in Full HD. To enter the 4K mode, you have to switch to the other camera apps first. This is where the 4K video mode is hidden. For those of you who want to edit 4K videos on a PC or Mac, you’ll appreciate the the fact that you can choose between the popular h. 264 codec, which is supported by all video editing programs, and the more modern but cumbersome h. 265 codec. For the test, we initially focused on the SuperSlowMo function, since Sony is advertising it as a reason to purchase the XZ Premium. If you know what you want to film in extreme slow motion, you can create a wow effect with a lot of practice. Sony itself has made an effort to demonstrate this itself in a promo video. But it's not enough to just pull the XZ Premium out of your pocket and wait for a SuperSlowMo sequence. Light plays a very important role, because if the scene is not well illuminated with natural light, the super slow motion is useless. Under artificial light, it flickers and the image rushes more and more as less light is available. We have edited some of our test videos so that you can see for yourself the advantages and disadvantages of the 960 fps slow motion videos. The limitation of the SuperSloMo sequence time window also complicates handling. The memory in the image sensor can record only 0.182 seconds of real time sequences with 960 images per second. In the film sequence this is a slow motion video with a duration of about 6 seconds. You can start this slow motion recording in a video as often as you want, but after each sequence the sensor needs about one second to store the information away from the sensor in parallel. So at the end you can record a very long HD video with 30 frames per second and super slow motion. The three-layer stacked sensor also offers other advantages besides super slow motion images. For example, the sensor records fractions of a second before the shutter release button is pressed completely, so that you can select the best of a maximum of four different videos after shooting. This function is called Sony Predictive Shot and works whenever the sensor detects movement. It even compensates for the unpopular rolling shutter effect of video DSLRs thanks to the buffer in the image sensor. In combination with the five-axis electronic image stabilization called Intelligent Active SteadyShot, the Xperia XZ Premium could even be used as an action camera. Sony is aware that a device with a 4K screen and this type of camera requires a lot of energy. The manufacturer has therefore extended the STAMINA mode to include the Smart STAMINA function. This analyzes the user's behavior and sends the data to Xperia Actions. The user then receives tips and tricks for optimizing battery life and an estimate of the period of time that the XZ Premium needs to be recharged. Despite this new intelligent prediction function, we have sent the Xperia XZ Premium through PCMark's battery test twice. First, with the 50 percent brightness setting that was customary in the past, the XZ Premium has an average battery life of 7 hours and 5 minutes. If you then run the benchmark test again with maximum brightness, the battery life is only 4 hours and 33 minutes. In everyday testing, the XZ Premium easily managed one working day with average intensive use. By the evening shortly after 10:00 p.m., 20 percent of the energy was still in the 3,230 mAh of the XZ premium. Unbelievable but true: in spite of Quick Charge 3.0 support, the delivery does not include a quick charge power supply. So if you want to charge the Sony Xperia XZ Premium via QC 3.0, you should already have an additional power supply or be prepared to pay $50 for the accessory. The extent to which Qnovo technology affects the battery life of the Xperia XZ Premium could hardly be judged at the time this review was written. Well, has it been worth waiting for the Sony Xperia XZ Premium with a camera that sounds fantastic on paper? To be honest, no. The Xperia XZ Premium is Dr. Jekyll and Mister Hyde in smartphone form. If you're a fan of Sony's simple and straightforward design, spend a lot of time planning and creating SuperSloMo videos, and spend as much time searching for 4K video content with HDR support or even HiRes audio, the Sony XZ Premium can be the ideal smartphone for you. But unfortunately the Sony Xperia XZ Premium is in no regard noticeably better than the Samsung Galaxy S8, LG G6 or even the HTC U11. The hardware of the XZ Premium is sufficient for the Premium edition, but unfortunately Sony's old weaknesses in terms of software again tarnishes the more positive part of Sony smartphones. Especially if you view the new XZ Premium camera as important, you can't hide the 4K function in other camera apps that separate ISO settings in manual mode from those for white balance, shutter speed and exposure correction. Certainly there is still a lot of video and photo quality found in the motion eye sensor, but Sony's software department hasn’t worked everything out yet. This gives you the feeling that you’re a beta tester when you use the XZ Premium. But with a little luck and perseverance, software updates could add to what Sony’s top smartphone has to offer. Well here we are 7 months after release and this phone will beat most other top end phones at everything. Plus Sony are have released oreo update to this phone four months ago while samsung and a lot of the rest are still lagging way behind, plus you can buy one now for £450 new, excellent phone. Just what I was hoping for: latest from Qualcomm, promising new sensor, muscled up panel and a decent battery, all encased in the timeless elegance known from Sony. Glass is back on the back and IP certification is there. Come July, it's mine! Sony,this brand was one of the best phone brands(was)but now they are lacking in some places.This phone is not that bad in terms of the specifications but I don't think that it will catch that many peoples minds.I personally like the phone,it feels quite good on the hands and the software isn't that bad but once again Sony has been making phones that were not good but with this they are getting there.Sony need to start getting the grove back because this is a strong phone but it will not sell because of the recent history Sony has had.The phone is different not in terms of the software but in terms of the design,to me this is what is sort of the strong selling point for Sony. Sony was once a great brand. People once swore by it. There are still loyalist stragglers who'll buy nothing but a Sony. But really, does this company really know what it wants to do with itself? A few months ago I read that it was leaving the mobile phone and television markets. What does it want to do then? Like Xiaomi, which likes to describe itself as an Internet company, and Snap Inc., which likes to be called a camera company, will Sony go on to reinvent itself as a 'visual arts company', and bask in self-glory? Personally I am not a fan of Sony phones. Living in the US Sony does not like us as consumers! Again no fingerprint scanner for US models. I always thought we had a pretty good fan base but I guess not. No carriers have them! Oh well, I guess I'll stick with my 50in. smart TV. I think they do better in the TV market! just curious why Sony items in US doesn't have fingerprint scanner? If the battery last long 1.5 days at least this will be the best flagship in 2017. Don't think it'll last 1.5 days but it should last a good 12-15 hours on medium/heavy use. The design is what sets Sony apart from the competition. Lately all cell phones look alike...but not Sony! I like it and am planning on buying one. Just not sure what color yet...leaning towards the black. I hate glass backs but it is what it is. Silver looks beautiful to me. Really, for some lay persons like me, I will think twice before I decide to buy Sony because of its angular and boxy appearance. Why Sony is just so addicted to its "OmniBalance design"? Because it doesn't copy the overused Chinese iPhone clone design with antenna lines under each corner and the beveled metal. Even the S7 looks like this on the bottom beside the speaker grill and charging port. Sony uniquely sticks to its own design and avoids copying other brands' overall looks. Right now Sony is trying to save on costs and raising profitability so they can spend more money behind R&D. Maybe in the next 2-3 years, we'll see a major redesign of omnibalance with very thin bezels and a more curvaceous and better looking design without blatantly copying any other brand. how great are Bezels! all the iPhones and iPads have them as do the Sony devices. works perfectly for games and also watching movies. couldn't buy a device that did not have Bezels - need something to hang onto. Would you mind if the bezels were 30% smaller (not completely eliminated) though? They will eventually do it (I'm guessing IFA 2018 flagship) with pressure to go bezel-less coming from LG and Samsung with the G6 and S8.